Are your children bored when travelling by car? Don’t listen to their “Are we there yet?” every five minutes. Load new funny passengers into your car with the Funny Road Trip application and see how fast your journey will go by. You might be thinking, “Oh no, they’ll just be using their cell phones for the whole trip again! ?“ Don’t worry! Your children will interact with you and their surroundings. I’m an MC, it’s rad to travel with me. 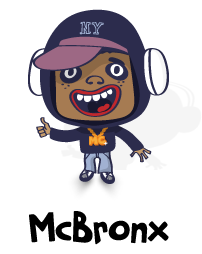 MC Bronx is my name and rapping is my game. Hamburgers and fries, I’ll open your eyes before the destination arrives. Just choose me, you won’t regret, we’re gonna have some fun and your trip will be set. I fly on a rocket, that’s just how I rock it. I’ll take you to the stars, before you know it you’ll be out of the car. 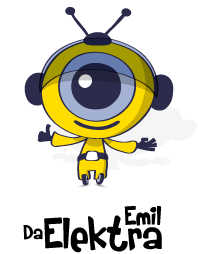 Take Emil with you and you won’t be blue. I’m a travelling robot and I’ll travel with you. Konichiwa, I’m Sushi Sakura, from the land of the rising sun. Take me with you on a trip and I’ll show you all the wonders of nature. 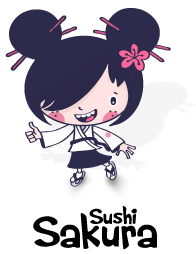 I’ll teach you a few basic Japanese words, and we’ll be there before you can say “sushi”. In the name of all Sakuras, let us travel! Seňor Tortilla, Buenos dias, I’m glad to see ya! You’ll see a dance from Mexico, with me it’s never stop-and-go. 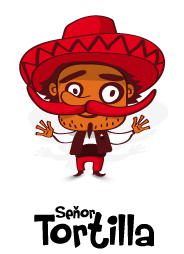 I got a moustache and a sombrero and I’ll dance the Bolero. Your trip will pass in no time, morning or evening, homies feelin’ fine! Choose one of the four virtual hitchhikers. Every hitchhiker has unique features and provides you with a different type of fun. Listen to this hitchhiker character, look around you and enjoy fulfilling the tasks. Each hitchhiker has fifty unique tasks prepared for you and during the game he will give you bonus curiosities. Funny Road Trip can entertain you for hours. During the game you can change the languages of the hitchhiker’s voice so you can train new vocabularies in different languages. If you fulfill all the tasks, you can choose a different character of hitchhiker and enjoy Funny Road Trip again and again! Hilarious! 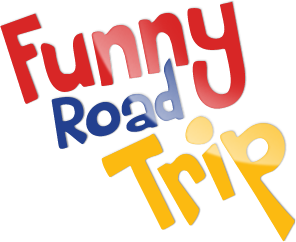 Funny Road Trip will not fail to keep your kids entertained on long car journeys! We believe that this game is somehow unique and original. Our kids love to play it and all of us enjoy it on long road trips. Worth it: I don't want to save it for a big road trip. I think it might be fun for a 30-minute drive too. Really funny and smart app. Thanx! Funny, lovely charactes that will make a trip with kids a piece of cake!!! Cannot wait till next one! To parents who are pestered by repeated sentence 'Moooomm, are we there yet?' the Funny Road Trip app can bring peace and good mood on board. Konečně něco, co lidi neodvádí od sebe, ale přivádí k sobě! Největším přínosem pro děti ve Funny Road Trip je možnost nenásilného učení cizího jazyka. Precizní grafické zpracování jednotlivých obrazovek v kombinaci s animacemi zabaví děti na dlouhé hodiny. Wir fin­den eine Kinder-App spe­zi­ell für lang­wei­lige Auto­fahr­ten mit Kin­der genial.Funny Road Trip ist für alle Fami­lien ein ganz hei­ßer Tipp, nicht nur zur kom­men­den Ferien-Saison. Copyright © 2012 Sugar & Ketchup. All rights reserved.